In fairness, it was weird. That’s what completely new things feel like – weird. Not the familiarity of the tried and true and too often repeated. And being so original it can make one uncomfortable with its intimacy. Not just the kind shared between the lonely poet-of-sorts and a computer program, but the unveiled honesty of the whole experience. From the start we see a famous pregnant woman’s photo (Demi Moore’s 1991 Vanity Fair cover, anyone?) come to life in Theodore’s mind as pure fantasy (weird, right?) and further to his brief, anonymous phone call with a woman who encourages him to choke her with a cat in order to bring the interlude to climax. Super weird. These aren’t things we’re used to seeing or thoughts of a nature we’re used to sharing. Theodore is alone, and as he’s not surrounded by another person, there is no reason for artifice. He communicates like we all do with our most intimate selves – we just happen to be watching – and that’s the problem apparently. It is fully accepted and understood that we all live private lives that we don’t share with anyone – something always is held back for fear of how it will be construed. But Theodore doesn’t have this limitation: telling all to an insanely curious operating system (desperate to know the world and to know this man) he’s not at risk of being judged the same way his blind date will judge him. These characters are real and more importantly, honest. The normal bet-hedging we all do when we meet someone gets eliminated here. She’s forthright with her fears, though appropriately hesitant (for effect) and does her best to grow as a person. She wants him to be happy and wants the same for herself. Instead of being the trapped housewife we might imagine, she’s actually living an incomparably full life – one Theodore can never match. Being that close (as viewers) to the unbelievable highs of new love and the (inevitable?) growing apart that these two go through, is an unsettling experience. 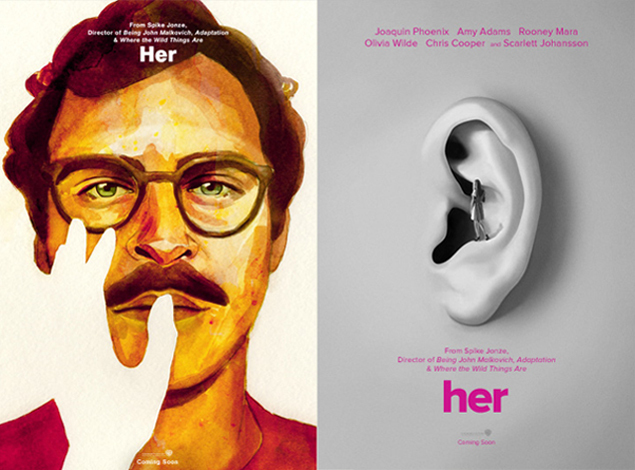 So yeah, “weird…” is a perfectly appropriate description of “Her” but also woefully incomplete. It’s also about the scars of losing someone and the scariness of loving someone else again. It’s about selflessness and shared existence, about our desire to find happiness almost anywhere. Could you love a computer program? I think most will be quick to dismiss the notion as too fanciful, but isn’t (sufficiently bright) Artificial Intelligence, still “Intelligence?” And isn’t that half or more of what we come to love about another person – or at least the part that really sticks? Sure, the way they wrinkle their nose when they’re about to sneeze, or the way they hold their coffee with both hands when it’s cold, are super cute, but is it the lion’s-share of why we love them? In the end, isn’t it the relationship between our intelligence and another’s, that pulls the lever in our brain, the one releasing the dopamine and serotonin that cause us to get so insanely high that we act all kinds of crazy in love? Would it have made a difference had Theodore reached Samantha on the phone randomly at the start of the film, as opposed to uploading her onto his computer? His having never known she was a program – would we view it any differently? There are plenty of people who have relationships that are entirely long-distance, one’s where they’ll never meet the person on the other end of the phone, or computer. Little odd? Maybe, but not dismissively so. 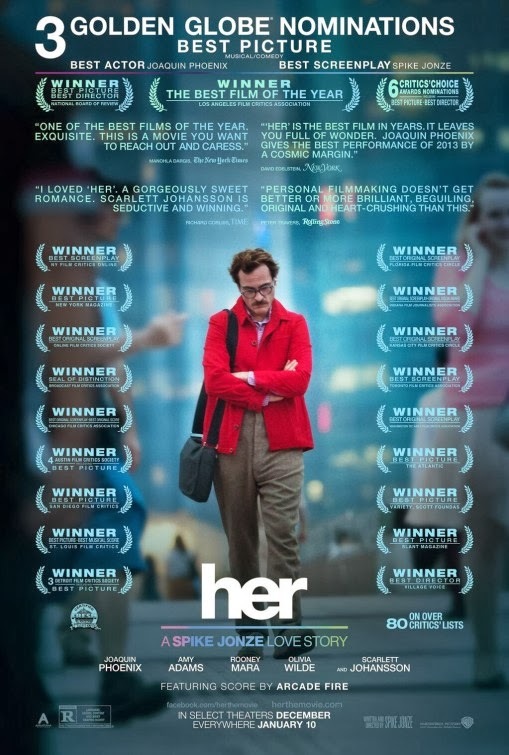 I’m haunted by so many aspects of this film: What does it say about the connections we make and the connections we don’t? Towards the end it kind of dawns on Theodore that everyone is having these silo-like-relationships. It’s almost a “Soylent Green is made out of people!” moment. But far less ominous, of course. Would such a relationship, undertaken knowingly, be “healthy” in any way? There clearly aren’t any ethical implications, right? Wouldn’t an unchecked AI with the power and sophistication of Samantha be incredibly dangerous? I mean, Terminator starts with far less in the way of operational processing power, doesn’t it? More importantly: if Samantha can feel things, emotionally, what kind of responsibility does that place on Theodore (or anyone) to treat her in a respectful manner? Is an AI, regardless of how sophisticated, just a series of switches and impulses sending out hyper-realistic communication, but ultimately nothing more than so many magnetically positioned ones and zeroes? And if so, should it be excluded from the same respect we pay to animals? Or the mentally deficient? If an AI (like the newly resurrected Alan Watts of the film) is created with a sufficiently complex “personality” does that mean it should be afforded the same rights as a person? Meaning it would be unethical to shut it down without due process? Much like an iceberg, the total mass of questions this movie represents are largely unseen, I just wish more people saw the exposed parts for how intricate they are. ← There are no cats in America?